Shōnandai Station (湘南台駅, Shōnandai-eki) is a railway station in Fujisawa, Kanagawa, Japan, jointly operated by Odakyu Electric Railway, Sagami Railway (Sōtetsu), and Yokohama City Transportation Bureau (subway service). It is 15.8 kilometers from the starting point of the Odakyū Enoshima Line at Sagami-Ōno Station and is a terminal station for both the Sagami Railway Izumino Line and the Yokohama Subway Blue Line. The ticket wickets of the three lines converge on one wide underground concourse. Odakyū Enoshima Line - Rapid Express and Express trains stop at this station. The Odakyu Enoshima Line has two elevated opposed side platforms, connected to the station building by an underpass. The Sōtetsu and Yokohama Municipal Subway stations are both underground, and both have a single island platform. 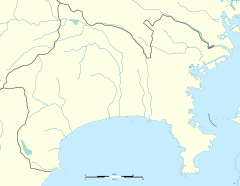 Shōnandai Station was opened on November 7, 1966 as a station on the Odakyū Enoshima Line. The station was greatly expanded in 1999 with the addition of the Sagami Railway Izumino Line on March 10, and the Yokohama Subway Blue Line on August 29. Wikimedia Commons has media related to Shōnandai Station. This page was last edited on 4 January 2019, at 23:56 (UTC).